The Checklist of CITES species provides the official alphabetical list of CITES species, their scientific synonyms, their common names in English, French and Spanish (to the extent that these were available to the compilers) and an indication of the Appendix in which they are listed. It also indicates the original listing date of all taxa (orders, families, genera, species, subspecies) and populations specifically named in the current or past Appendices, all reservations ever made by Parties, with the dates on which they entered into force and, in the case of past reservations, the dates on which they were withdrawn. The 2013 edition has been extensively revised and includes the changes to standard nomenclature and to the Appendices adopted at the 16th meeting of the Conference of the Parties (Bangkok, 2013). This publication should be particularly useful to CITES Management and Scientific Authorities, Customs officials and all others involved in implementing and enforcing the Convention. This brochure includes snapshots of the analyses made, and the trade value and trends of key commodities of Appendix II species. It also presents many of the trends graphically, thereby giving readers a better grasp on the extent and importance of the Convention in the conservation and sustainable use of species. The 11th edition of this comprehensive publication presents a history of the evolution of CITES. It begins with the basics and guides the reader through its complex structure. It presents the provisions of the Convention and relevant Resolutions and Decisions in an accessible way as well as providing explanations and comments to facilitate an understanding of the Convention and of how it should be implemented. This publication is now available here for downloading in PDF format. The Identification Manual is a collection of online data sheets designed to help identify various species of fauna and flora with drawings (black and white), maps and concise descriptions. It is a useful tool for Management and Scientific Authorities, Customs officials, and all others involved in implementing and enforcing CITES. This identification manual is designed to offer wildlife law enforcement officers, scientists and managers a tentative visual means of distinguishing different types of ivory (elephant, walrus, whale, etc.) and of ivory substitutes (bone, shell, manufactured substitutes, etc.). This publication is available as PDF file (946 KB). Click here to view or download it. Posters can be ordered, at no cost, by emailing: [email protected] . 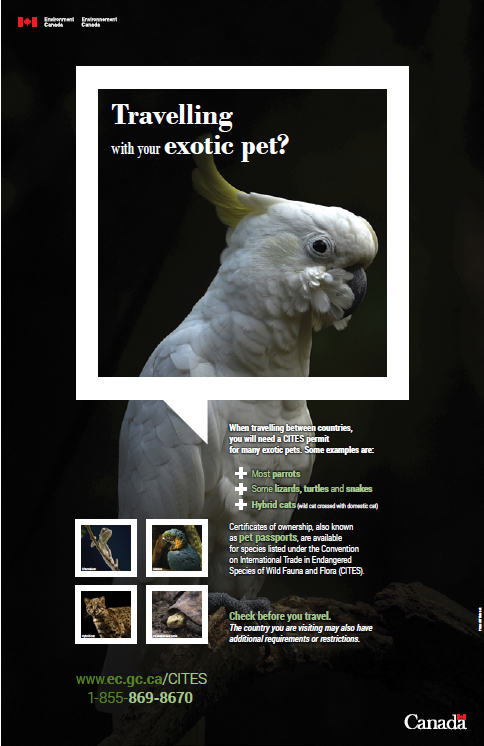 Please indicate which poster you wish to receive ("Travelling with your exotic pet") along with your name, the name of your organization, mailing address and the number of posters you are ordering. 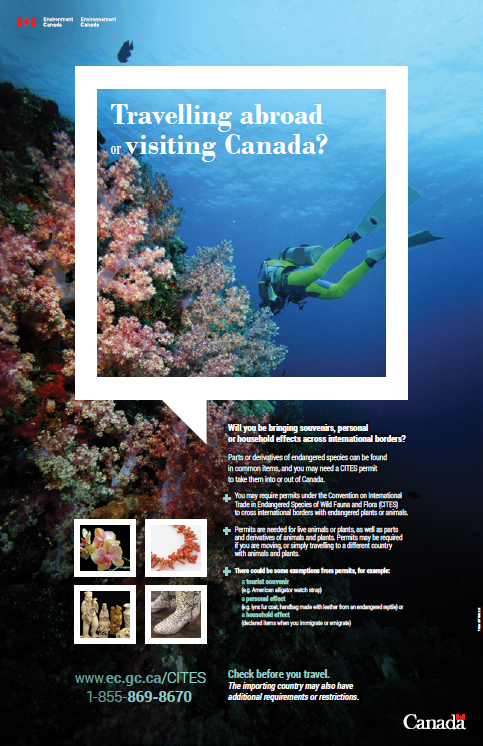 CITES World is a biannual newsletter published by the CITES Secretariat as an official newsletter of the Parties. The newsletter is available on this site in PDF format. The Bulletin is available on the IISD website in PDF format. Volume 9 (in English only) is a handbook for the identification of the Cactaceae included in CITES Appendix I; Volume 12 (in Italian and English) includes succulents as well. The purpose of these publications is to facilitate their identification by Customs officers or other border inspectors. It can also help collectors to identify the rare species so that they can avoid purchasing specimens of wild origin. With colour paintings and concise descriptions, this richly illustrated guide will help identify many of the birds included in the CITES Appendices. Presents the findings of a survey of the Nile crocodile Crocodylus niloticus, in six east/central African countries and Madagascar conducted in 1987-1989. The project was designed to give assistance to countries that had started to use their crocodile resources and were looking to continue exploitation through ranching. This publication contains the results of a study of the exploitation of the African monitors in various countries, and includes a look at the economic and ecological aspects of the problem. In French only. A review of the distribution, status, exploitation and trade in the following four species: Varanus bengalensis, V. griseus, V. flavescens and V. salvator. This book is a review of the distribution, status and trade in three taxa: Python curtus, P. molurus bivittatus and P. reticulatus. It includes a series of recommendations to improve their chances of survival. These Proceedings give a complete account of the 11th meeting of Conference of the Parties. They include: the documents that were prepared for the meetings; the minutes of all the sessions; and the results of the meetings, i.e. Resolutions, Decisions and amendments to the Appendices. Proceedings of previous meetings of the Conference of the Parties are also on sale. 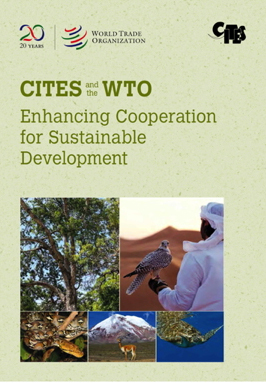 The relationship between the World Trade Organization (WTO) and the Convention on International Trade in Endangered Species of Wild Fauna and Flora (CITES) is a leading example of how global trade and environmental regimes can support each other and cooperate successfully to achieve shared goals, says a new publication launched by the WTO and CITES on 22 June 2015. The Wildlife and Forest Crime Analytic Toolkit was prepared by the United Nations Office on Drugs and Crime (UNODC) with the support of the Secretariat of the Convention on International Trade in Endangered Species of Wild Fauna and Flora (CITES), the International Criminal Police Organization (INTERPOL), the World Bank and the World Customs Organization. 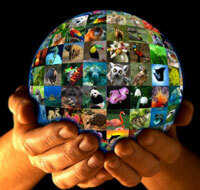 Together all five agencies form the International Consortium on Combating Wildlife Crime (ICCWC). Recommended by CITES and recognized as the international standard for transport of animals by air, the IATA Live Animals Regulations (LAR) is an essential source of information on how to ship animals safely, humanely and cost-effectively. It specifies the minimum requirements for the international transport of animals, and indicates what precautions airlines, shippers, cargo agents and animal-care professionals should take on the ground and in the air. The LAR can be ordered here and is available in both book (English only) and CD-ROM format (English, French and Spanish). Recommended by CITES, the Perishable Cargo Manual is the reference guide for the preparation, packaging and handling of perishable goods to be transported by air. This manual has a special section about requirements and instructions for plants transportation, including cooling, shipping temperatures and storage guidelines. The PCM is available in English only and can be ordered here in book and CD-ROM format. Environment Canada, the CITES Management Authority for Canada, has developed CITES Identification Guides on amphibians; birds; crocodilians; turtles and tortoises; butterflies; sturgeons and paddlefish; tropical wood; and hunting trophies for individuals responsible for enforcing CITES. They provide in English, French and Spanish, detailed information for the identification of species protected under CITES and, in some cases, look-alike species that are not protected. These guides can be downloaded here. Kew Garden coordinates the production of standard CITES references for plants. The checklists are produced by using an international panel of experts on the plants concerned, and are adopted as standard references by the Conference of the Parties to CITES. To date Kew Garden has developed CITES checklists for: orchids (five volumes published to date); bulb plants (Appendix-II genera Cyclamen, Galanthus and Sternbergia); cacti (second edition); Aloe and Pachypodium; succulents; and carnivorous plants; as well as a user guide on CITES and plants. You can download these publications or order the hard copies online. This is a compilation of the proceedings of a symposium on community-based natural resource management (CBNRM) for the conservation of CITES-listed species which was organized by the Austrian Ministry of the Environment and the European Commission in Vienna, Austria, in May 2010.